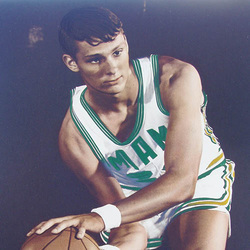 Rick Barry is not only the greatest basketball player in University of Miami history, but he ranks as one of the most outstanding college and professional stars of all time. His varsity career at Miami spanned three seasons, starting in November of 1962 and continuing through the close of the 1964-65 season. He was a consensus All-American at Miami and went on to a 15 year pro career, where he won almost every scoring and all-star honor along the way. He is the only basketball player in history to win scoring titles in the NCAA, American Basketball Association (ABA) and the National Basketball Association (NBA). He won the NCAA scoring title his senior season with an average of 37.4 points per game. He was the 2nd pick in the 1966 NBA draft. He was the 1966 NBA Rookie of the Year, won a World Championship in 1975 with the Golden State Warriors, and named the Finals MVP, he was a 6 time All-NBA first teamer, 3 time All-ABA first teamer, and an 8 time All-Star. But Rick was not quite an instant star at Miami. True, he had an outstanding season with the UM freshman team, averaging 28.8 points, but his career with the varsity started off slow, with only 11 points in his first 2 games. But in his third outing, Barry scored 27 points to led the Canes to victory over Rhode Island, and the Barry legend was on its way! That was the start of the greatest era for University of Miami basketball, as Rick led the Canes to records of 23-5, 20-7 and 22-4, the only three consecutive 20-win seasons in school history. They claimed the school's first post-season victory with a win over St. Francis in the National Invitational Tournament (NIT) in 1963. They won the Steel Bowl Classic and took two of three Hurricane Basketball Classics, with Barry being named Most Valuable Player twice. They also participated in the NIT his first two seasons, making four straight post season appearances. Barry's sensational scoring and his outstanding rebounding were never approached by other Hurricane cagers. He scored 2,298 points in his career, averaging 29.8 points in his 77 games. He had 61 games of 20 points or more, and in his senior season, he had games of 59, 55, 54, 51, and 50, plus five other games in the 40's! He holds the school's top 8 single game scoring totals ! He still holds 15 single game, season or career records, including most points and most rebounds. He came to Miami from Roselle Park, New Jersey and would later marry his first wife, Coach Bruce Hale's daughter, Pam, and they had four sons, Scooter, Jon, Brent and Drew, all of whom played pro basketball. He also has a daughter, Shannon, and a son, Canyon. He was inducted into the Naismith Memorial Basketball Hall of Fame in 1987, and in 1996, was named one of the 50 Greatest Players in NBA history.